As seen in the Oct/Nov 2008 issue of Paper Trends magazine! 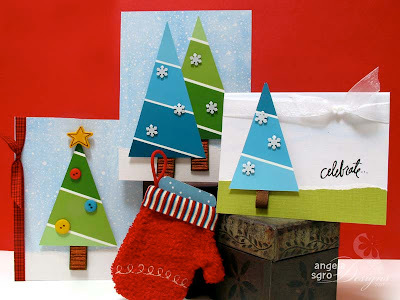 Here are three quick and simple holiday cards that I created using, ... wait for it, ... Paint Chips! Yup, that's right! Those sample swatch sheets of color that you get from the paint or hardware store before you buy the full gallon. I chose Behr's wide 5"x6" paint chip samples to design these cards. I decided to use the paint chips on an angle to create a more dynamic design. First I started by cutting the text off of the left side of the chip. Next I trimmed off the remaining two rounded corners, leaving me with a rectangle. Then I cut the rectangle in half on the diagonal, from corner to corner, giving me two triangles. Finally I measured the left side of my triangle. I marked the same measurement on the long side of the triangle and trimmed from corner point to the mark to make the base of my tree. I now have two trees ready to decorate! I titled this one "Celebrate Tree." For this smaller card, I created a slightly smaller triangle. I tore a strip of green cardstock to create my deckled edge "ground" and attached it to the bottom of the card. I accented the tree with white snowflake brads and a ribbon "trunk." Finally I finished this simple card with sheer ribbon and a rub-on. This is my "Twin Pines" card. 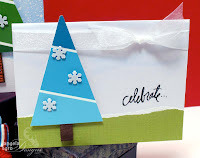 For this card, I first covered my folded base cardstock with a snowy patterned paper. I then adhered a torn strip of white textured cardstock along the bottom to make "snow." I again accented my trees with white snowflake brads and ribbon "trunks." 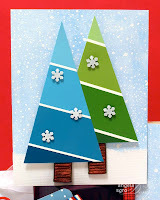 My final card is called "Christmas Tree" and it is the most colorful of the trio. Like my "Twin Pines" card, I started with a similar snowy backdrop. 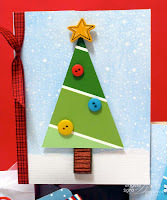 But I made this one more playful by accenting the tree with a wooden star and colorful button "ornaments." I finished it off with a length of red plaid ribbon. You are so clever - those are wonderful, thanks for sharing that idea! Uh-oh...better warn the paint departments. I think there's going to be a sudden shortage of paint chips that may last until Christmas!! These are great...now I have to head to Home Depot to raid their selection! How fun are these! Absolutely adorable. OMG!!! Those are just WAY TOO CREATIVE! I LOVE THEM! Thank you for sharing this fabulous idea! That is so clever. Now I have a reason to get out of the house. "DH, we need to go to Home Depot"
I love this idea! I have a ton of paint chips left over from stamping on (when they first were popular a few years ago) and now I have something NEW to do with them! Thanks so much for sharing this clever idea with us all! Yes I will be "CASING" this idea but I will definately credit you and send my readers over here to see for themselves! What an awesome idea! You have really inspired me for my Christmas cards this year - definitely going to swipe a bunch of paint cards from Lowe's & Home Depot, ha ha. I think my family will love these as much as you do, and I've already shared this with lots of friends and family. You are so creative! very clever how you cut these on the bias! Makes for a much more interesting design than a straight cut. Awsome! Your artworks are really inspiring, thank you so much for being so creative and for sharing your ideas with us! You are very creative. Thank you so much for sharing your wonderful ideas. This is a clever idea ! Wonderful idea and such adorable cards! I have a small box full of paint chips-I take some every time I see them-but then forget what I wanted them for. This is way cute. There should be a place to submit cutie stuff like this! I just hope I don't get banned from Home Depot for taking all of the paint chips. Thank you!! I have been an artist and crafter all my life, and a graphic designer by trade. My card design hobby started with rubber stamps and then exploded when scrapbooking became popular. I went full time when the magazine publisher that I worked for went bankrupt in 2006. (When one door closes...) I now design cards and paper craft gifts for clients as well as for contests and publication. (And friends and family, of course!) My goal is to design for a product line(s) and/or publisher and eventually publish my own card-making book(s). 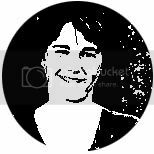 Unless otherwise stated, all content, including designs, concepts, templates, patterns, text, and photographs are ©2007-2011 Angela Sgro. All content on this site is for personal inspiration and enjoyment only, and may not be reproduced for any commercial purpose, publication or contest submission. Please contact me with all other publication usage requests. Paper Crafts March/April 2009 - "Butterfly 'Time Enough' Card"
Paper Crafts March/April 2009 - "Baby Animal Card Trio"
Paper Trends Oct/Nov 2008 - "Holly & Snowflakes Card"
Paper Trends Oct/Nov 2008 - "Paint Chip Tree Cards"
Paper Trends Oct/Nov 2008 - "Halloween Treat Boxes"
Paper Crafts Holiday Cards & More, Vol. 3 (Oct 08) - "Holiday Photo Tags"
Paper Crafts: 3 Ways (Aug 08) - "Holiday Gift Card Tags"
Paper Crafts Aug/Sept 2008 - "Wedding Cake Card"
Paper Trends Feb/March 2008 - "Tuxedo Card"
Paper Crafts Dec 2007 "Holiday Gift Wrap" Challenge Winner - "Santa Gift Boxes"
Paper Crafts: Card Creations, Vol. 6 (Dec 07) - "You're 50"
Paper Crafts Dec 2007/Jan 2008 - "Snowman Poop"
Paper Trends Dec 2007/Jan 2008 - "Charmed Birthday"
Paper Crafts June 2007 "Get Inspired" Challenge Winner - "Hawaiian Shirts"